Nippon Paint Professional Painting Services.... yet again! Past 3 weeks have been pretty overwhelming with recent reno works done at home. So far, I'm pretty much happy with the contractor I engaged honouring the timeline. "Please make sure all will be ready 1 week before Raya!" Now that reno works are done, we're moving on to another very exciting part! Painting the living room and all 3 bedrooms. Of course my choice would be none other than Nippon Paint Professional Painting Services. Yes, working with them for the second time. Because of their strong commitment to client satisfaction. Gotta applaud the effort put in by Nippon Paint prepping for the paint job. They did an on site inspection of the whole house before they started painting. 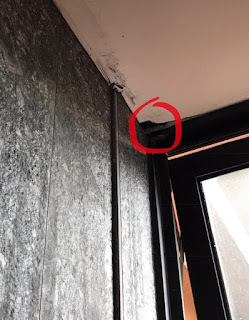 Exceptionally touched when they actually went out of their way to also inspect my bathrooms' ceilings considering that's not part of the deal. And yes, they were super kind to help me fill the hole in my bathroom. Really love how detailed the entire team was finding and fixing wall and ceiling flaws before they commenced painting. That, plus I don't need to worry about anything despite knowing very well that painting is going to be a messy job. Shifting and Protection of furniture and floor were all handled so meticulously. They make sure that everything is covered with plastic so no drops of paint will drip on my furniture and new flooring. Masking tape around fixtures all. And to think my husband actually suggested that he too can paint the house. He'll sure will leave tell tale signs of paint spatter....missed spots all, his DIY job surely splotchy and uneven. If you want your painting needs to be superbly well taken care of, look no further. 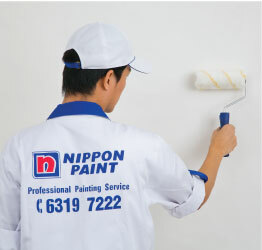 The answer is: Nippon Paint Professional Painting Services. 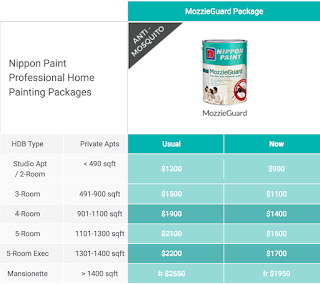 Sit back and relax while the professionals do a fuss-free, no-mess paint job for your home. Since my home is on ground floor, I have selected the Mozzie Guard Package. Will continue to update you alls ok. Looking forward to restoring beauty and vitality to my home just in time for Hari Raya.